When working with electricity, there are no second chances. At RANS Electrical, we make certain safety forms the cornerstone of every job we do. Our organisation recognises that safety is everybody’s responsibility. That’s why at RANS Electrical we actively promote a risk-free working environment that is safe from accidents and injuries. To maintain a safe working environment, we provide all staff with safety training and support that follows clear policies and procedures on every job site. Safety isn’t just about saying the right words and ticking the policy boxes, it’s about fostering a culture of safety into the core of everything we do. 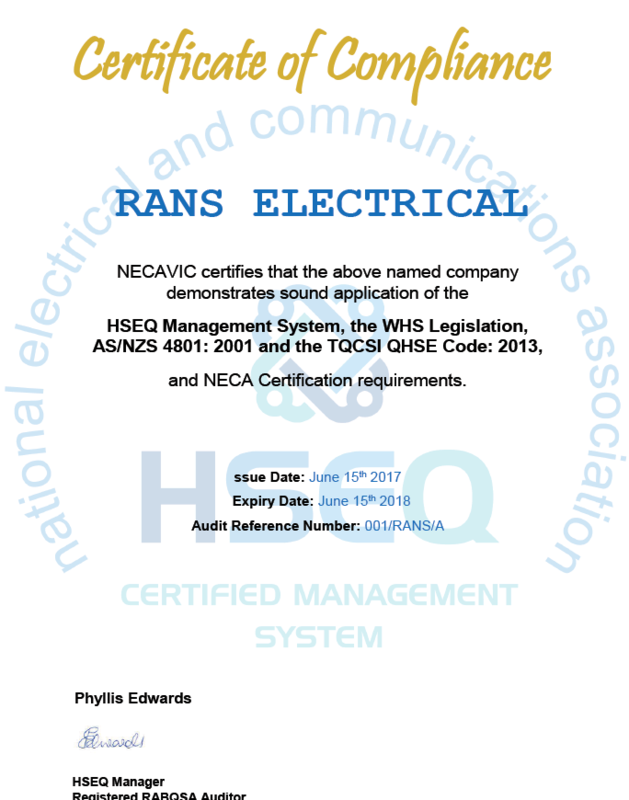 At RANS Electrical, our staff know that if they believe a situation is unsafe they can report it and corrective action will be taken. By choosing RANS Electrical, all work completed will be on the forefront of safety and to the highest of standards. You can find our OHS policies below.